We have a small chest freezer in the house. A Nordfrost one. We have had it many years, and it has been ok, but it has required a new thermostat as the contacts on the old one burned out. And every time the compressor shuts off, it interferes with the TV, causing a momentary jerk in the motion, or pixelation, or a slight glitch in the sound. When an inductive load is switched off, the energy stored in the magnetic field (in this case in the windings of the motor) tries to keep the current flowing, developing a big voltage across the switch contacts and causing an arc. The arc is like a spark-gap transmitter and generates radio interference. 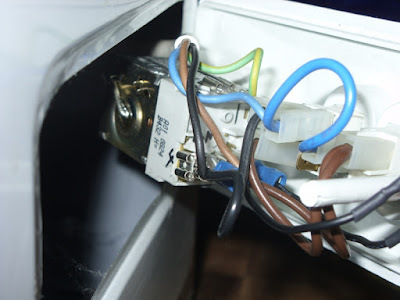 The solution, it seemed to me, was to fit a "snubber circuit" which is a capacitor in series with a resistor wired across the thermostat contacts. 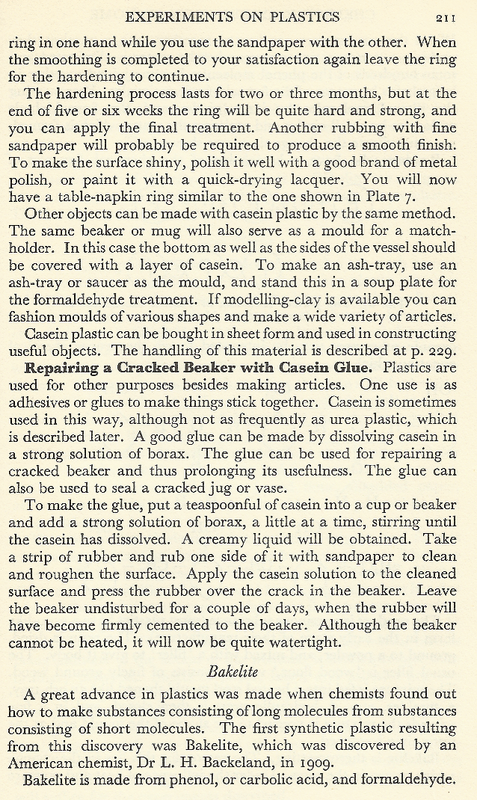 The energy which would have caused the spark now flows into the capacitor and is dissipated in the resistor. 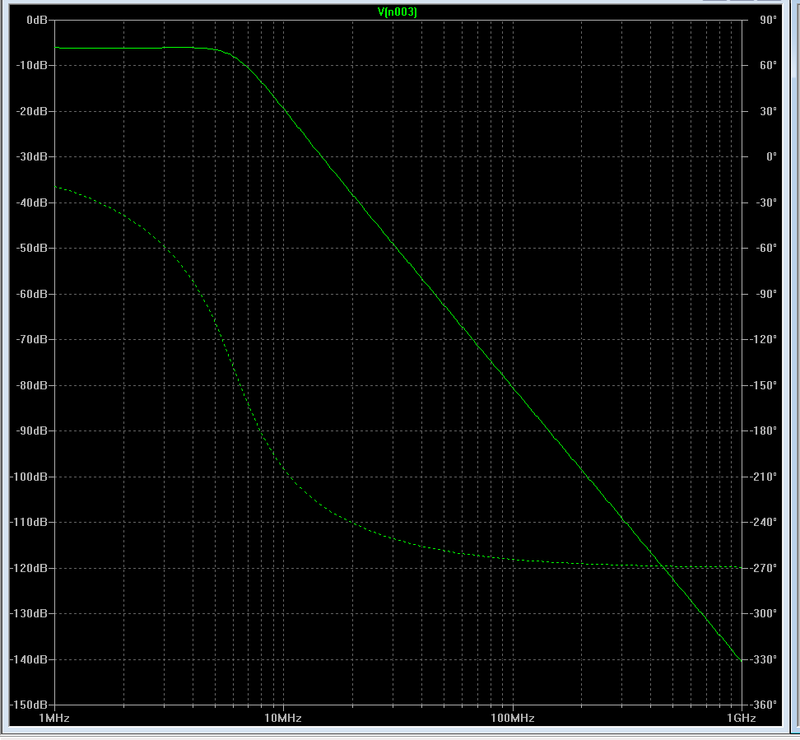 I measured the inductance of the compressor - 43mH. I also measured the current drawn by the motor - 0.66 Amps. Then I calculated the energy stored in the inductance, which is "a half L I squared", or 0.5*L *I^2. 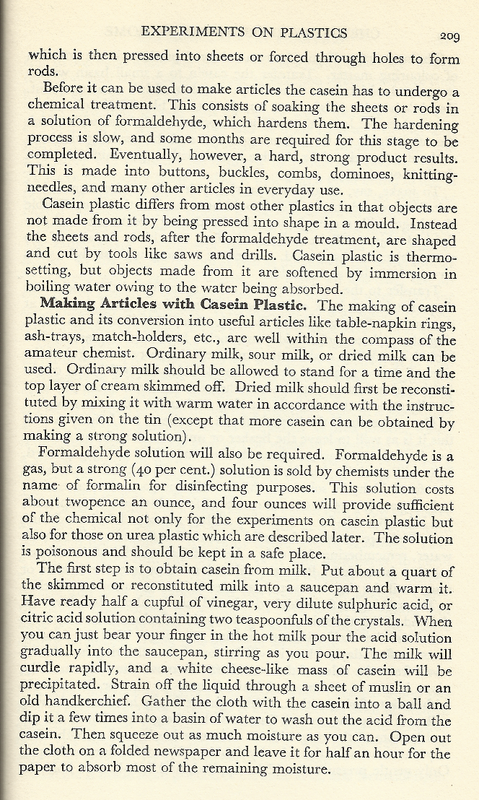 There is a similar equation, "a half C V squared", (0.5C*V^2) for the energy stored in a capacitor, and I reasoned that I needed a capacitor to store about the same energy as was in the inductor. It worked out at 315nF. I had a couple of 220nF capacitors in the junk box. 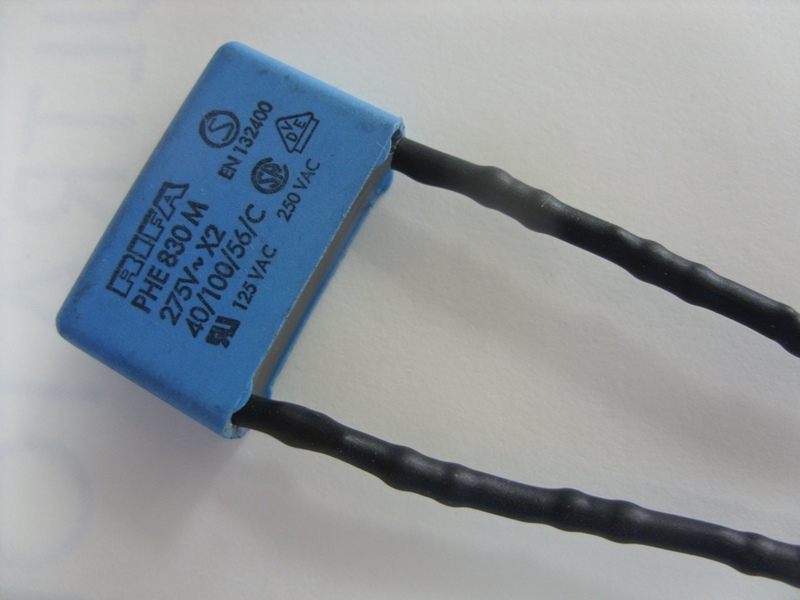 Importantly they were X2 rated capacitors (see the marking in the photo below) which are suitable for connecting directly across the mains. These X2 metalised film capacitors are "self healing" - if the dielectric starts to break down the internal spark evaporates the metal on the plastic film and the area of broken-down dielectric is isolated. Some types of capacitor can fail with a big bang and a puff of smoke when the dielectric fails. When I looked on the internet there was a lot of stuff about designing snubbers for MOSFET circuits, and Switchmode powersupply circuits. They all said that the time constant of the C and the R needed to be about 10% of the "on time". Not sure how that relates to a thermostat, but the mains frequency is 50Hz, and so each cycle is 0.02 Sec. The time constant of my 220nF cap with a 10k resistor is about 0.002 Sec so I plumped for a 10k resistor. The time constant is calculated by multiplying the C by the R. And it is the time taken for the capacitor to discharge to about 30% of it's starting Voltage when discharging through the resistor. It probably doesn't matter much as long as there is some resistance to dissipate the energy. When the motor is not running the snubber will have quite a lot of Voltage across it - most of the mains Voltage. A 220nF capacitor will pass quite a few milliamps at 240V. 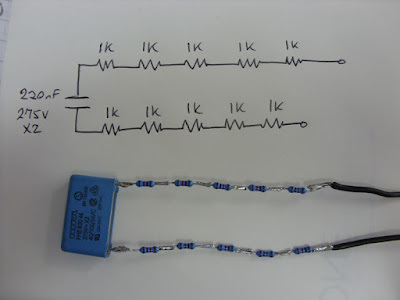 It is possible to work it out with phasor diagrams and power-factors and things, but I simply connected the circuit across the mains and measured the Voltage across the resistor - which was about 135V. Since power = V squared over R, that is about 1.8 Watts being dissipated in the resistor. In fact it will be less, because the motor is in series. At first I paralleled up 10 x 100k metal film resistors, but that is quite a fat bundle. I found it was better to series 10 x 1k resistors and cover them with heatshrinkable tubing. Each resistor is good for about 0.6W, so in theory my chain should be ok dissipating 6W, but it is good to have some margin of safety. 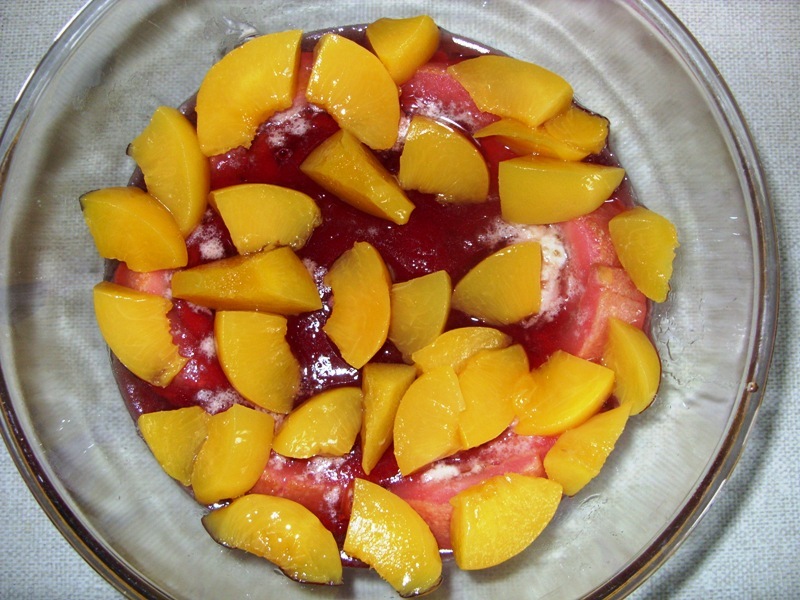 The long thin arrangement dissipates the heat better. I put five on each leg of the capacitor. The Nordfrost thermostat is mounted in a plastic box in the front of the cabinet, so it is quite easy to get at - there is also a fair amount of room inside the box to accommodate extra components. 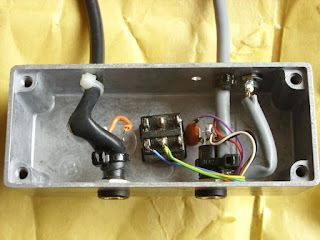 I used some of the "piggy-back" type 1/4" push-on connectors to connect the snubber circuit. Since these just crimp on to the wires there was no soldering to do. Here's a picture with the cover removed - there is rather a tangle of wires, but nothing is danger of shorting to anything else so it is ok! 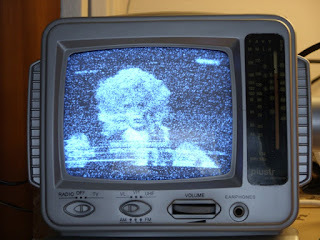 So I installed the snubber this evening, and we have been watching TV. Here's the interesting thing. 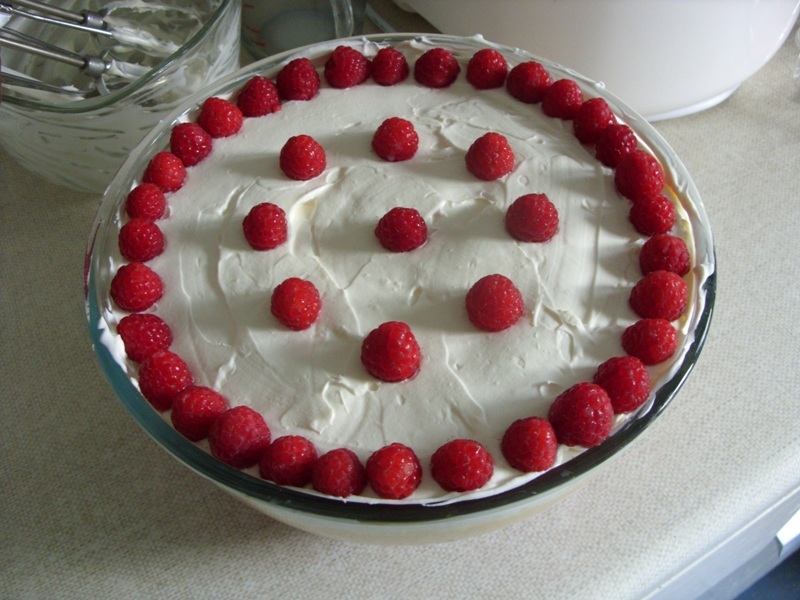 The interference when the freezer turns off has completely gone ... but ... there is sometimes a bit of picture disturbance when it turns ON ! Not sure what is going on there. 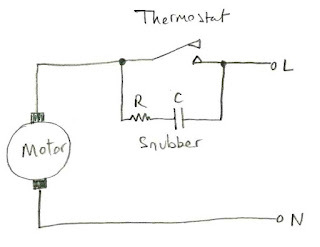 I wonder if it is something to do with the PTC starter circuit on the compressor - which is an extra winding on the motor that is connected at switch on, but is disconnected by a "Positive Temperature Coefficient" resistor once the motor is running ... I need to think about this. 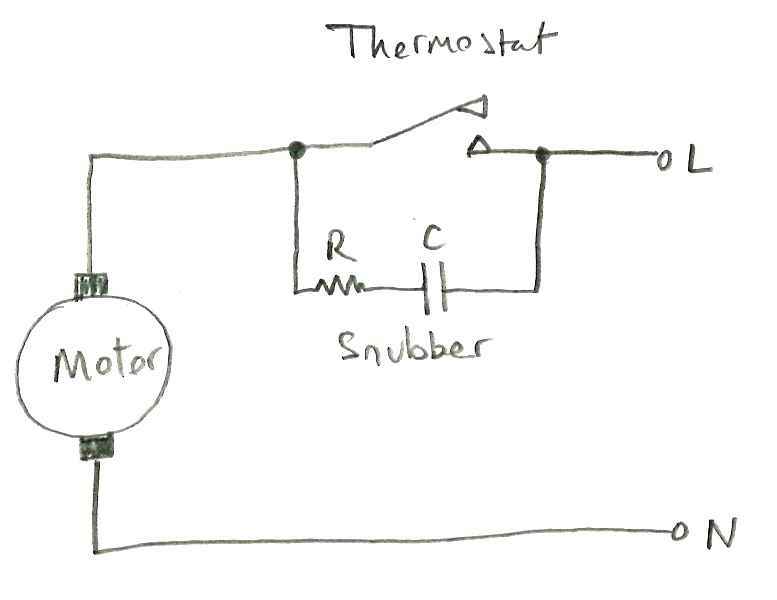 The other slight downside to the snubber circuit is an increase in power consumption - the result of having a small current flowing in the resistor when the motor is off - I guess it is about a Watt of electricity wasted during the off period of the freezer. Perhaps an in-line RF filter might help with the TV interference. At least the snubber should extend the life of the thermostat contacts. Having measured the values of the filter components in the Retevis Speaker-Mic, I thought it would be interesting to simulate the circuit and find out roughly what the cut-off frequency was. 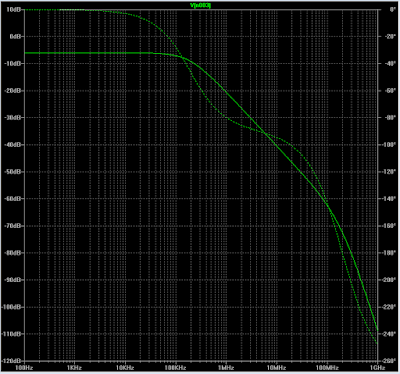 The cut-off is surprisingly low at around 5Mhz but the attenuation at 433MHz is (in theory) 120dB. However ... the input impedance is the input impedance of the audio input of the radio, modified by the long curly lead and jack plugs. 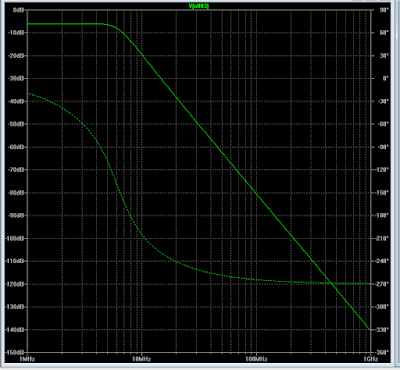 The output impedance should match the input impedance of the electret condensor capsule. Both of these are unknown, and only really measurable with complicated test gear. But I know the capsule measures about 2000 ohms with a Digital Volt Meter, so I did another simulation using that impedance. 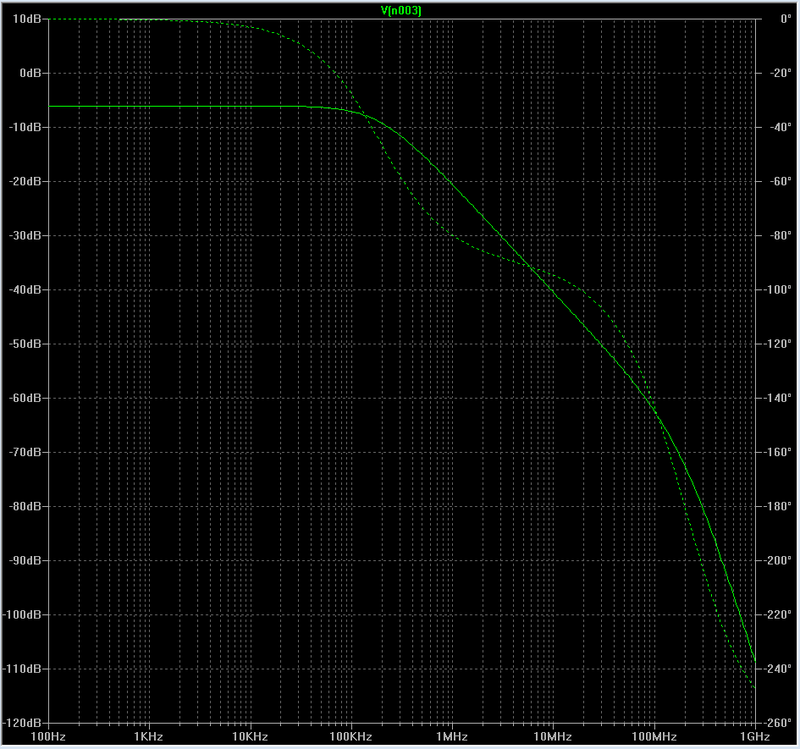 I also extended the lowest frequency down to 100 Hz to see what was happening in the audio range. It is very different. However the flat response up to 100kHz will still pass all the audio frequencies ok, and the filter still appears to offer significant attenuation in the UHF region. The dashed line, by the way, is the phase response, using the scale on the right hand side. The solid line is the amplitude response using the decibel scale at left. It would appear that the designers of the filter may have simply designed a 50 ohm impedance filter and hoped it would do the job. I think these tend to be deliberately lossy to absorb the RF energy, while at the same time having a low d.c. resistance. There are no markings on the parts fitted on the board, so it is difficult to tell what they are. One would normally expect the Q factor of a surface mount inductor to be, say 30 - 40. Still not sure what to put in my hands-free set-up! 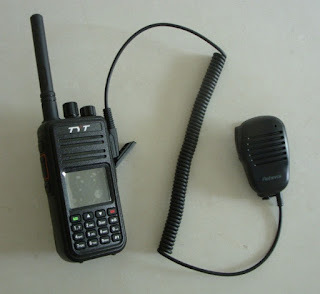 Just over a week ago I bought a new radio, a TYT MD-380 DMR handheld. A new repeater, GB7AS has just opened, about 6 miles from here, and I am keen to access it because it has very good coverage in this area. Indeed, with the links to other repeaters in Kent it should provide opportunities to work many of the amateurs in the the Folkestone area that have been in the shadow of the North Downs for me here. There is plenty of information about DMR on the Internet already ... although, later, I may blog a bit about using the programming software. I need to get to grips with it myself, first! One of the things I wanted to do was to make a hands-free set up for the car so that I can take it mobile. However the manual contains no pin-out information for the microphone and speaker, and I couldn't find much about the subject on the web. 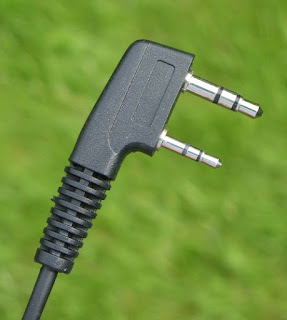 The situation is complicated by the fact that the same sockets are used for a USB programming cable. So I thought I would write a bit about that here. 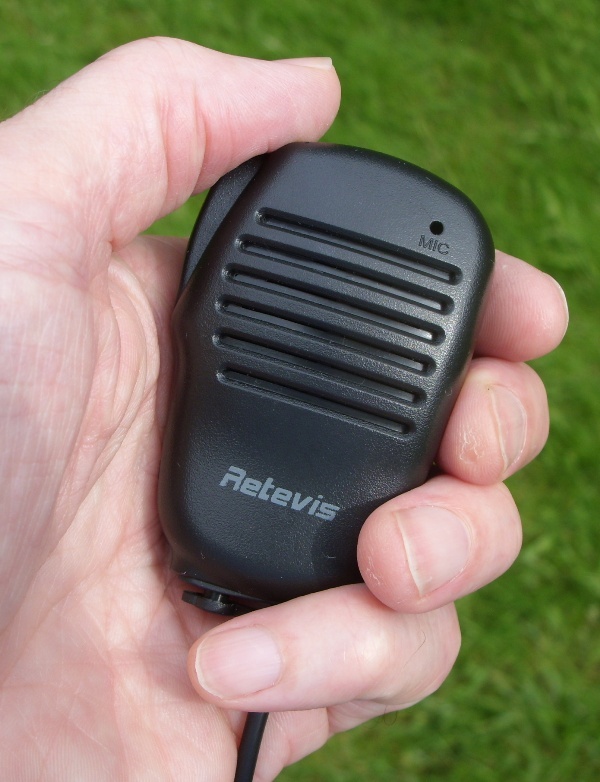 It is a Retevis 2 Pin PTT Speaker Mic for TYT MD380 (and other radios). Picture of it plugged into the radio at left. The microphone is surprisingly small, but quite comfortable to use. The sound is even more thin and tinny than that from the radio, which already has a sharp and penetrating quality. In the photo at left, just where my little finger is and where the cable enters the microphone body, is a socket to plug in an earphone. You can see this more clearly in the photograph of the circuit board below. There is a useful clip on the back which partially obstructs the top screw, you need a well-fitting screwdriver to avoid slipping out of this. 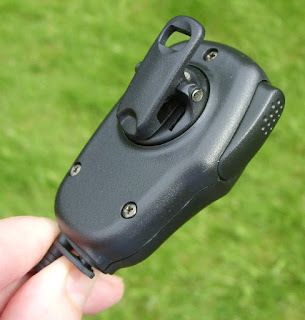 The PTT button has a nice feel to it with a tactile click to let you know the contacts have closed. After plugging in the speaker mic and checking that it basically seemed to work, I set about removing the screws from the back. There are a further three screws to hold the circuit board to the moulding, and you need to be careful not to loose the little rubber pad which goes between the PTT lever and the button on the board. Quite a nice PCB inside, with rather more components than I expected. 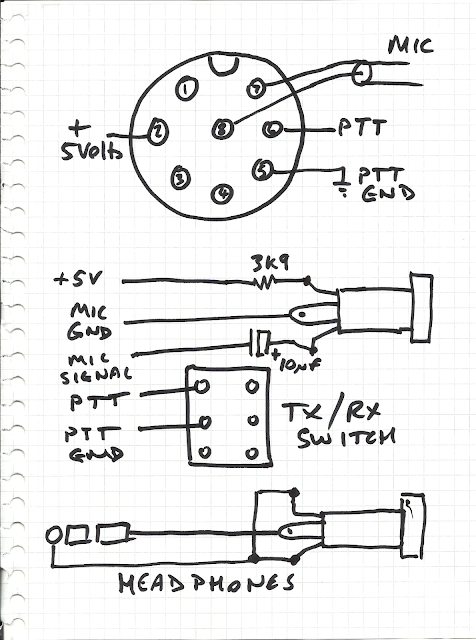 Tracing out the circuit, I can see that the surface mount capacitors and inductors are for filtering. Now this is interesting, because I have always taken the approach that you want to prevent RF from entering the microphone socket of the radio, but here the filter seems to be preventing RF from entering the Microphone capsule. Since all electret condesor mic capsules contain a little pre-amplifier (usually just a FET transistor), RF voltages picked up on the microphone cable could potentially demodulate in the microphone. The situation is made worse by the fact that the microphone is likely to be used in very close proximity to the aerial. 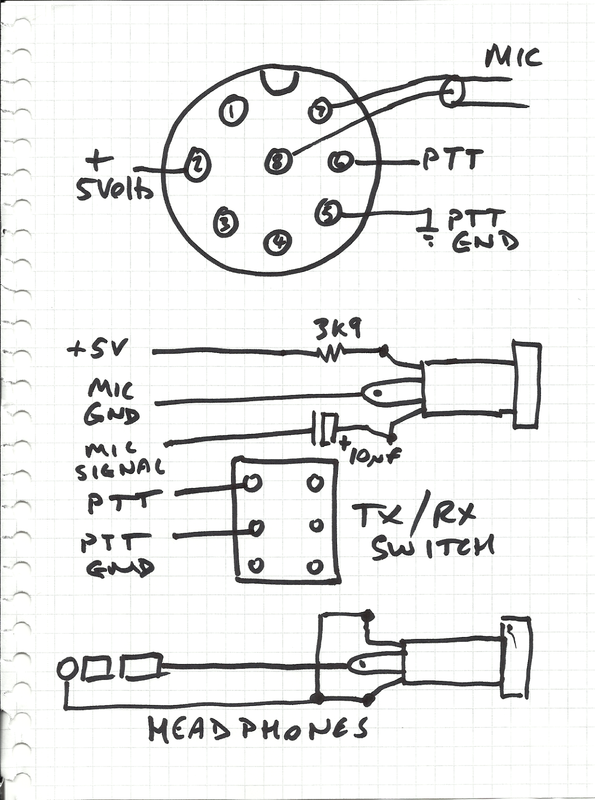 I have traced out the circuit, but not yet measured all the values. The measurement of the L's and C's requires their removal from the board as the other components affect the reading on the meter. 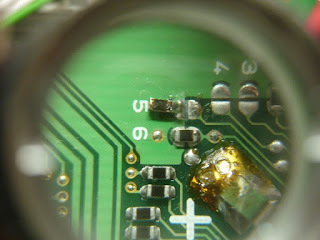 The connections are helpfully marked on the PCB, so all that was required was a continuity test to find which part of the jack plug was connected to which wire in the microphone. The unused (tip of the 3.5mm plug and ring of the 2.5mm plug) are presumably for the USB programming connection. 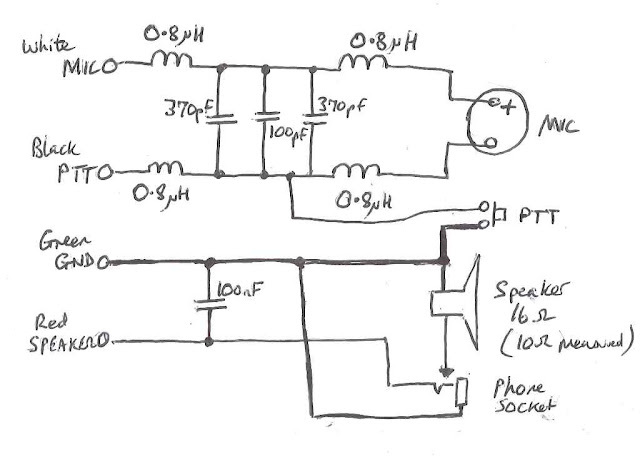 I note, from the specifications in the radio handbook, that the audio output is 1W into 16 Ohms. I measured the d.c. resistance of the speaker to be 10 Ohms - suggesting probably IS a 16 Ohm part (The d.c. resistance of a speaker usually measures a little lower than the a.c. impedance, as the latter includes the inductive reactance of the voice coil). At this stage, I am not sure whether to include the filter circuit in my hands-free set-up. In the car, the antenna is further away from the microphone, so the fields should be much less. 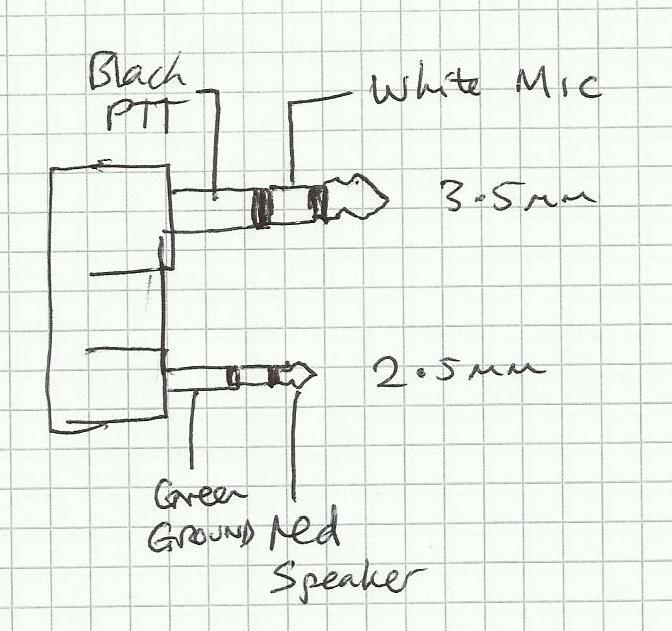 I may just put some small capacitors across the mic and see how well it works. The other question I need to mull over is whether to get hold of a 16 ohm loudspeaker, or to try using the 3 ohm speaker that I am currently using in the car. If a 16 ohm speaker is not available, I guess I could build myself a little audio amplifier - but that adds extra complexity and would need a 12V feed from an accessory socket in the car. So that is the story so far. I hope my look at the audio connections might help you make useful accessories of your own. 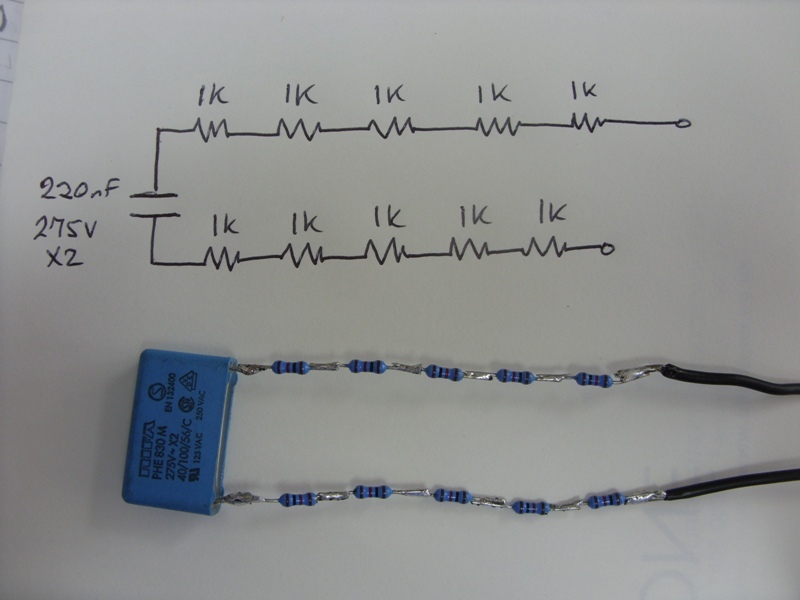 Update 13/6/2016: I measured the component values in the filter circuit and added them to the circuit. Also corrected a slight mistake where the PTT button connects to ground. 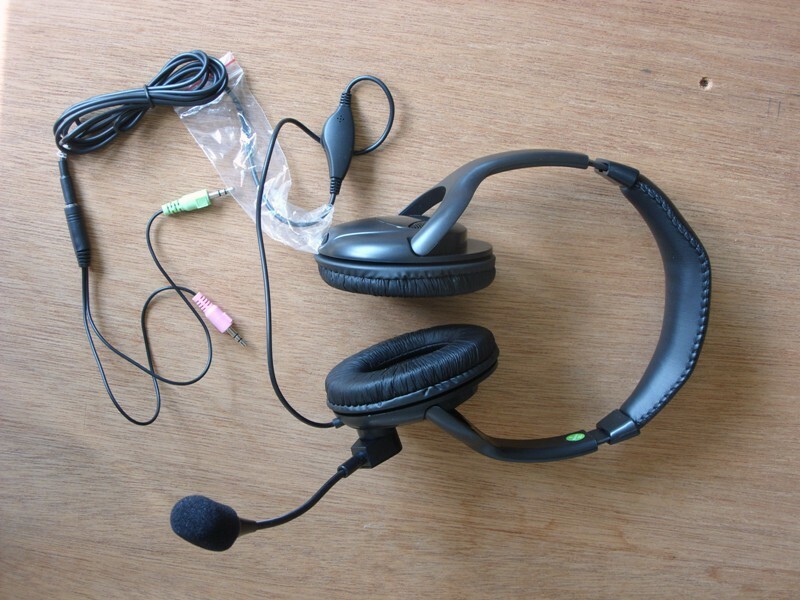 When operating a special event station it is useful if the visitors can hear the audio output of the radio, and it is also useful if the operator can wear headphones - because there is always chatter and other noise going on in these places. But, when you plug headphones into the Yeasu FT847 the loudspeaker is switched off, so no one else can hear. 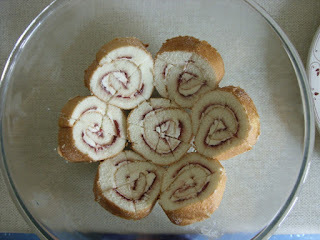 I found a fairly easy way round this. 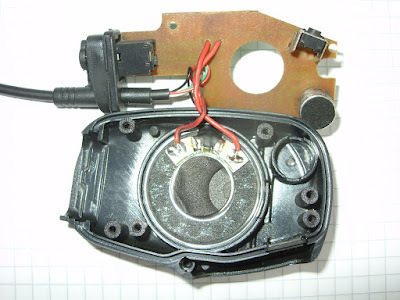 There is a second audio output available on the rear of the radio which has a 200mV output level, that is independent of the Volume control on the front panel. 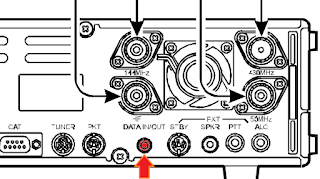 This is on a stereo 3.5mm jack socket marked Data In/Out. 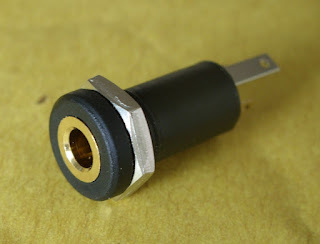 It is intended for connecting a packet TNC, or other data-mode device to the radio, but the audio quality from this socket is good. 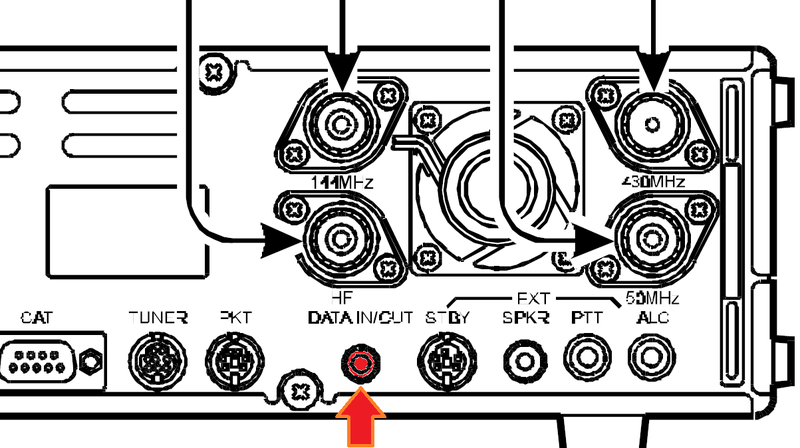 Red arrow shows the Data In/Out connector on the back of the radio. Do test the speakers with the radio on transmit before using them at the event, because PC speakers are notorious for being sensitive to RF fields and may demodulate your SSB transmissions in an unpleasant way! Fortunately the speakers lent to us by Chris, G6AFY, were of high quality and behaved very well. So here is a picture of me operating GB8WW with my FT847 and the PC speakers plugged in the back, the stylish, wedge-shaped thing in the foreground. If you look carefully you can see the adaptor-lead plugged into the back of the radio. The headphone volume is controlled by the AF gain control on the front of the rig and the PC speakers are controlled with their own volume control. 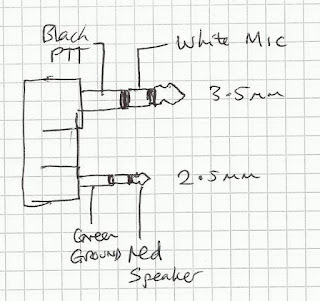 One of the criticisms of the FT847 is the "steppy" digital AF gain control on the rig, making it hard to get the right listening level - so using an external speaker on this audio output might be a way round this in the shack - so this adaptor might be useful for more than the occasional special event station. Some years ago UK Radio Amateurs were permitted to use the upper part of the 40m band, 7.100 - 7.200MHz. Many older radios, sold in the UK, such as my FT847, restrict the transmit range to what was previously legal, 7.000 - 7.100 MHz. It is rather frustrating when you can hear QSOs or CQ calls, but when you press the transmit switch you get a "beep" and an error message. Doubly frustrating when you know the circuitry is quite capable to transmitting and radios sold in some territories, such as the USA, do cover that part of the band. I wanted to use the radio during the forthcoming "Mills on the Air" special event station, GB8WW, and it seems that the 40m band is used a lot for Special Events, so full coverage would be essential. 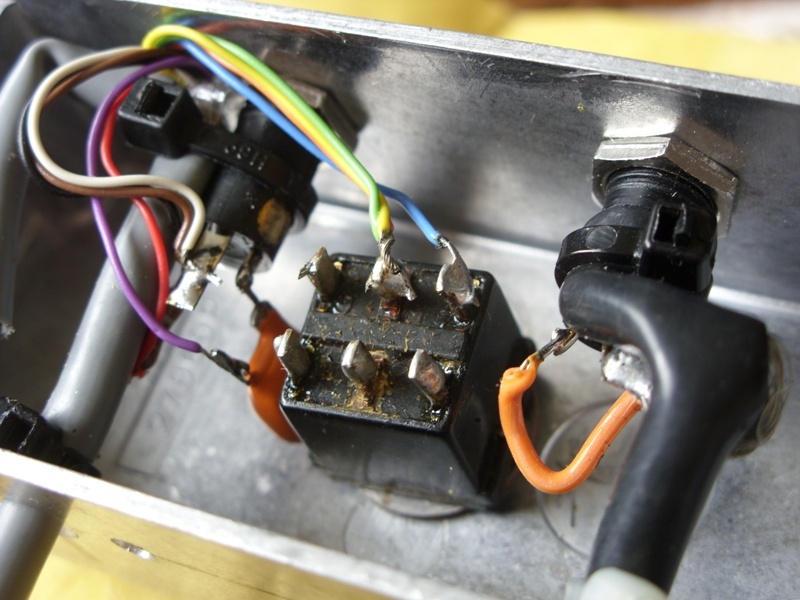 "Widebanding" radios, modifying them to transmit at any frequency, is quite commonplace, but requires the operator to take great care not to transmit outside of the band where they are legally allowed to. With the FT847 there is a further complication. The radio covers VHF and UHF as well, and the programming links which set the TX limits also affect the repeater shifts and the radio's ability to transmit on the 70MHz VHF band. Fortunately G1IVG has put a useful table on his website, here, which shows the different ranges available. 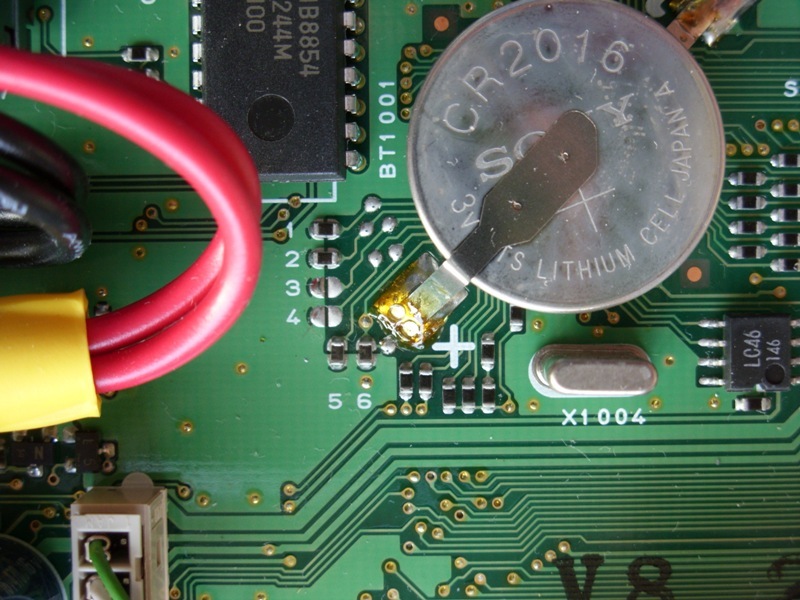 The programming links are on the PCB next to the memory backup cell. You can see them, numbered from 1 to 6 in this picture. The links look like surface-mount resistors, but are actually "zero-ohm links", and can be replaced by blobs of solder or very short pieces of wire. You can see that links 1, 2, 5 and 6 are shorted and links 3 and 4 are open. 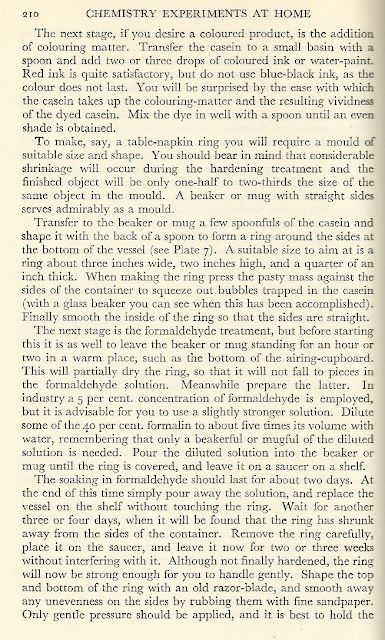 (Always useful to take a photo before you make a modification so you have half a chance of putting it right if it doesn't work!). Looking at G1IVG's table you can see that there are only two link settings where the radio has the 70MHz band, the first is the standard UK configuation that I have, and the second one has links 1,2 and 6 shorted and the others open. The HF options are in the table below, and this link combination gives the HF bands in row 5. 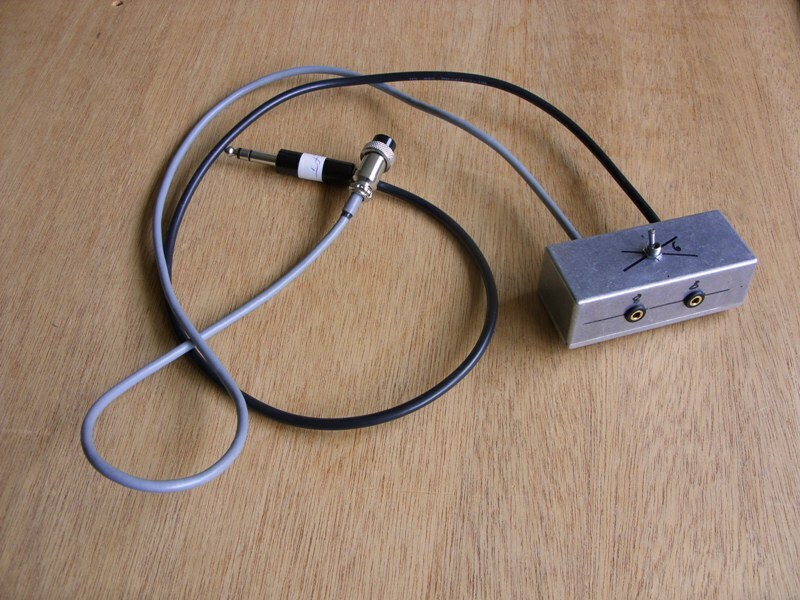 All the HF bands, except topband and 10m, are made 500kHz wide - so one still has to be careful not to transmit out of band, but, the problem of the 40m band is certainly solved by this. It doesn't allow the radio to operate on the 60m band, but (at the moment) this doesn't interest me much. The 2m and 70cm bands become very wide, 140 to 154 and 420 to 450 Mhz respectively, so again, some care will be needed when operating on VHF too. Performing this mod wipes all the channel memories and any changes you may have made in the menu system (display brightness, channel steps etc. ), I already had a list of all my channels, with the CTCSS frequencies, repeater offsets etc, but I went through the menu system and carefully recorded all the settings there too. So... I chose the finest soldering iron bit, found my tweezers and strongest reading-glasses, and set to work. Instead of removing the link 5 completely, I turned it round, so that it is still attached to the ground pad. That makes it easier to undo the mod, or reuse the link on a different pad if I need to. 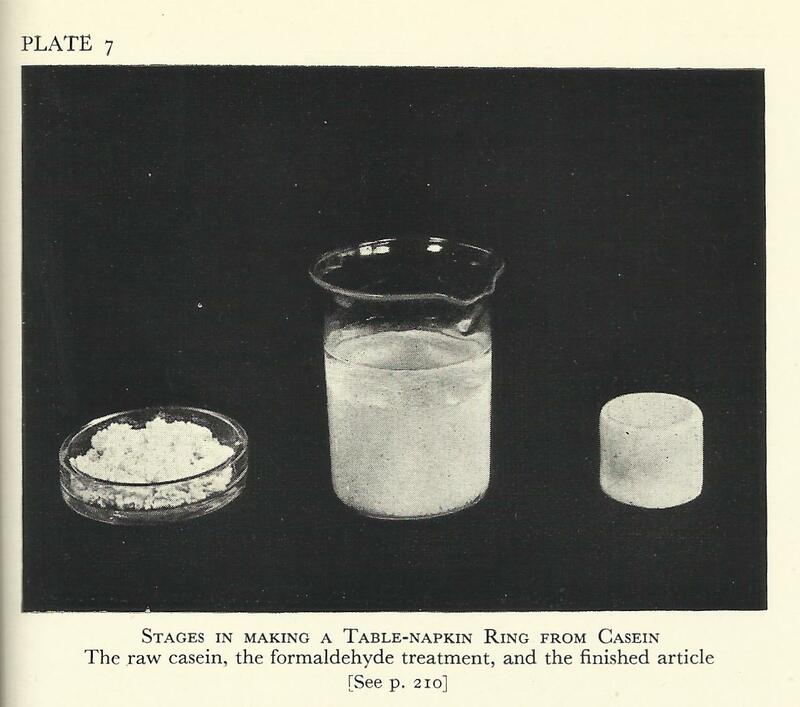 The photo at left shows link 5 under a magnifier. The links are only read by the microprocessor at factory reset, so it is necessary to hold down the "lock" and "fast" keys when you power up the radio for the mod to take effect. This is why all the all the channel memories are erased. I turned the power control down to minimum, attached dummy loads to all four antenna sockets and carefully explored the frequency ranges. I am pleased to report that the new transmit ranges seem to match up with those in the table. The repeater offsets basically match up with the UK standard settings, except for 50MHz where the offset is 1MHz instead of 500kHz. This is configurable in the menu system. So it all seems quite promising, and the radio is "good to go" for Mills on the Air 2016. Two part-pictures received on the 8:19pm pass. Very nice visual sighting, with the station coming within a few diameters of the Moon and then passing very close to Jupiter in the twilight sky. 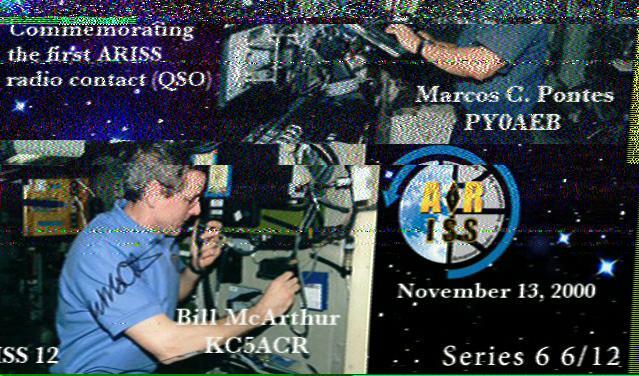 It was a nice surprise to get an SSTV picture from the ISS on its 6:43p.m. pass. I think the Russian Cosmonauts are commemorating the first Amateur Radio contacts aboard the ISS by sending SSTV pictures like the one above. 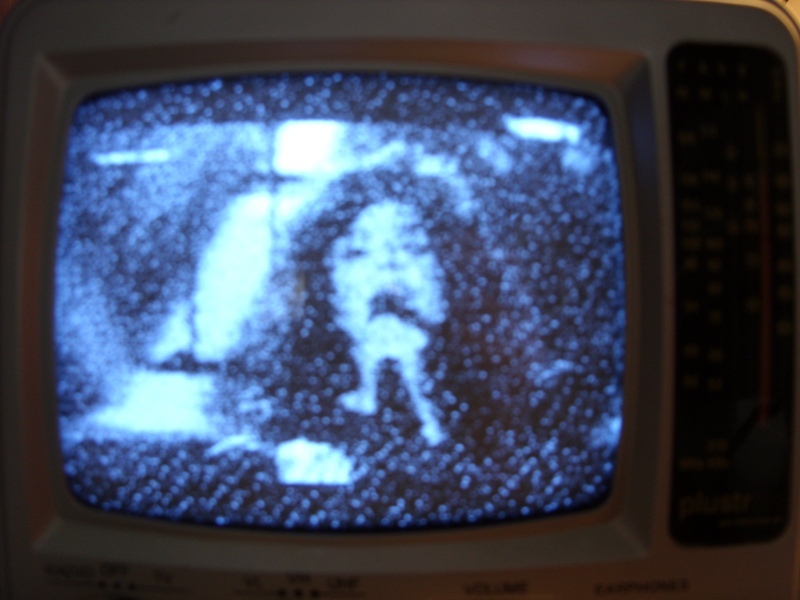 I was using the free MMSSTV software, with the 2 meter radio connected to the sound card input. But for some reason the software didn't automatically select the correct mode (PD180). 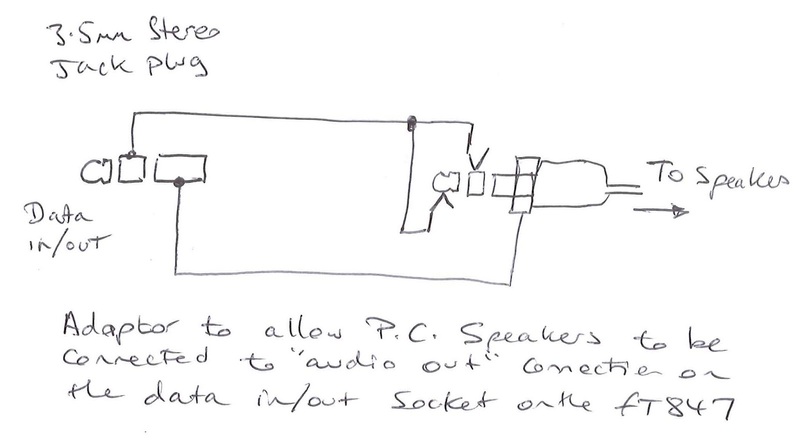 Fortunately I had a little Olympus voice recorder recording the sound from the speaker, so I was able to feed that back into the sound card and get the picture above. 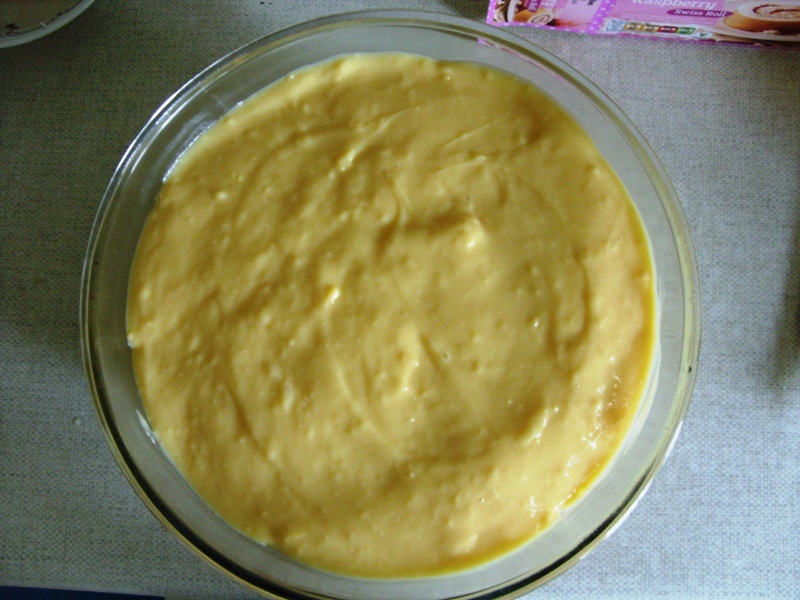 The data compression might account for some of the patterning on the picture. 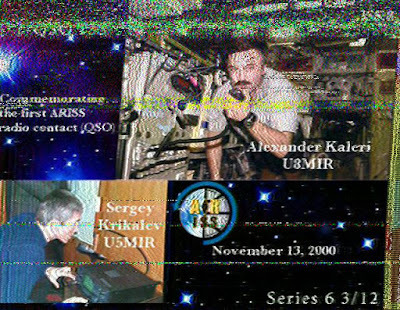 The transmissions are on the usual downlink frequency of 145.800MHz. 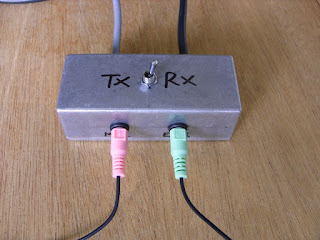 You can read about how to do it on the AMSAT website here. 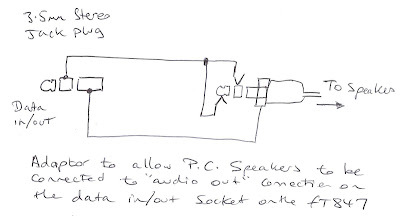 But you don't need anything more sophisticated than a scanning receiver speaker output connected to the sound card line input. I just use my normal "white stick" colinear antenna, but a 1/4 whip, or even a rubber duck should pick something up. I use the Orbital Prediction Page on the AMSAT website to find out when the ISS is coming over. 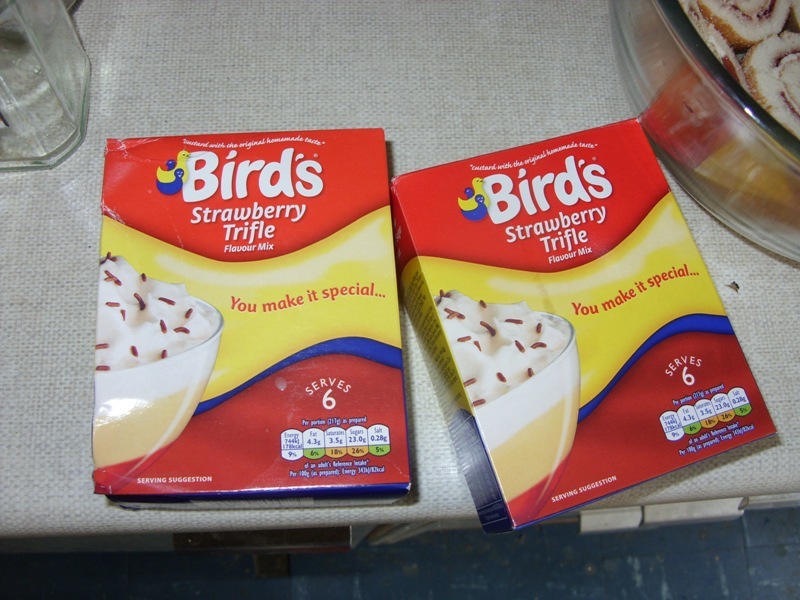 Two boxes of Trile Mix - Strawberry Flavour. Swiss roll, with jam and cream. Chop it up so everyone gets a bit. Add the strawberry jelly. 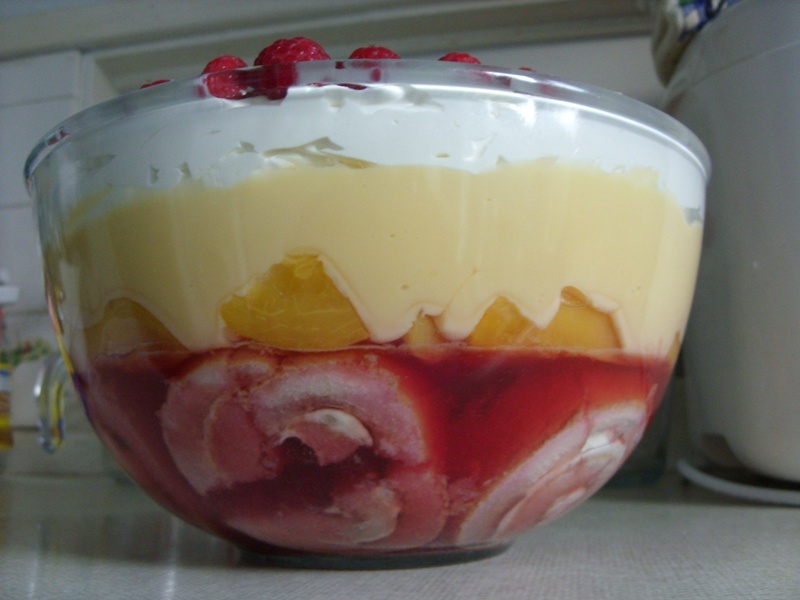 Put in the fridge to set. Separate the peach slices from the liquid and chop them up a bit. ... 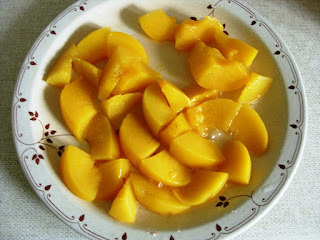 Early next morning ! Moroccan raspberries are actually a bit disappointing, some nice raspberry flavours, but little sweetness. Hopefully be ok with all the other sweet things in the mix. Since fitting the SSD the computer is very quiet, so , one evening, my attention was drawn to the sound of the fan whirring. An investigation with Windows Task Manager revealed that wuauserv was running. This is the Windows Automatic Update service. It was using 50% (one core) of the CPU. After an hour I got fed up with it and started Windows Update manually to see what was going on. It just sat on "checking for updates" ... And nothing happened for another hour. So I gave up and disabled auto updates. Looking on some computer forums, it seems that others have had issues with the wauaserv locking up. But if your auto-updates are broke there is not much chance of downloading an update to fix it. On one forum I found "Windows Offline Update" was a solution, so I decided to try it for myself. It is not Microsoft, it is Open Source. It allows you to download all the updates for a particular version of Windows, and copy them onto, for example, a USB stick. Then you can install all the latest updates onto a machine which is not connected to the Internet. I was attracted to it because it gives a bit more control over the update process. There is a very good tutorial about it by Eli The Computer Guy.. It is worth watching this before attempting to use the software. I found there were 2.5 GB even without the Office 2007 updates, so be prepared for a big download. The software worked very well, with a Windows "front end" that has check-boxes to select what you want to download or install. When you have made a selection some sort of script starts in a "command line" style box. 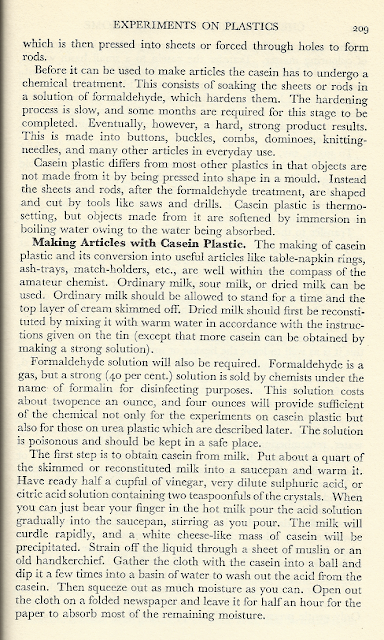 Each step of the process appears on the screen and is logged to a file. Although I had expected the offline updater to use its own software, it actually seems to use Windows own routines for at least some of the work ... including the dreaded Wauaserv! And, when a line appeared on the screen saying something like "building I.D. list of required updates", nothing happened for a very long time ... nearly 2 hours, in fact. If it hadn't been for the additional message which said "this may take a long time, please be patient" I would have aborted the process. The updater found, and applied, 19 updates. This kind of software would be ideal for a computer repair shop where many computers have to be updated. Also if you have to reinstall windows, it might be useful to have the complete set of updates on a DVD or memory key. For myself, I need to learn "patience", when wauaserv " locked up" it was probably just halfway through checking what updates were needed. Will we reach a point when our computers can do nothing else but install updates all day long! I will probably go back to using Windows Update, but do so manually, putting up with the red shield symbol and the nag messages at boot-up. It won't be long before Microsoft stop supporting Vista anyway. So last time I told you about increasing the size of the RAM. Now to actually fit the SSD. The computer guy is fitting an EVO 840 SSD, but it seems identical to the Samsung 850 EVO 250Gb SSD I bought from Amazon. If you watch this video you will see that the guy making it has problems getting the connector on the hard disk to make proper contact with the socket in the computer. 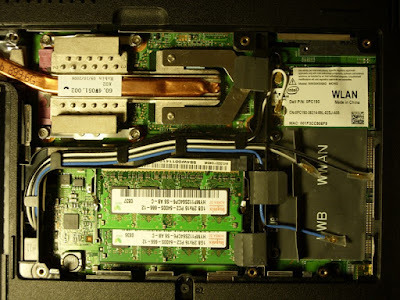 The problem is that the SSD is slightly slimmer than the old hard disk and the SSD needs to be lifted slightly when you slide it into the slot. It is confusing because when the SSD misses the connector it still slides fully home and almost feels as if it has plugged-in. When you power-up the computer you get a message saying "No boot device available". The cardboard has been folded over so there are two layers. 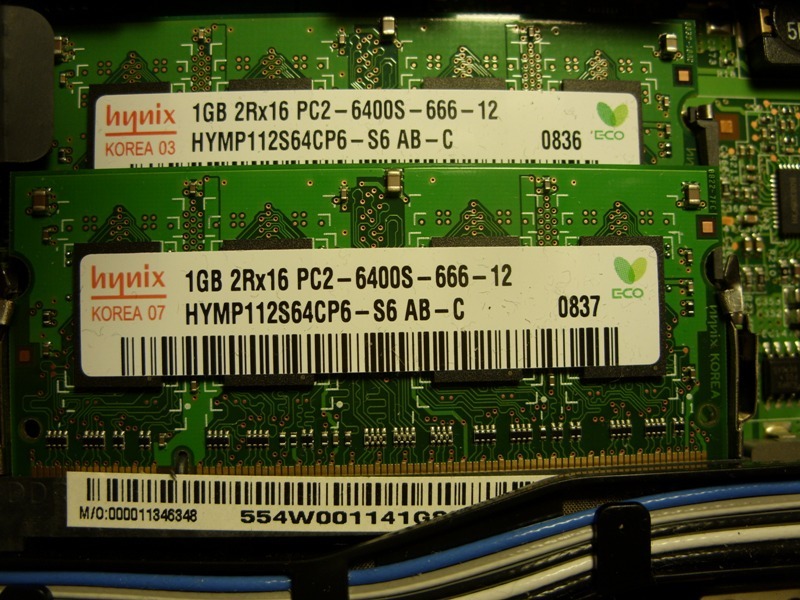 The photo also shows the Samsung SSD mounted in the tray which is part of the computer. It is necessary to take the tray off the old disk and fit it to the new one. There are just two small screws holding it on. 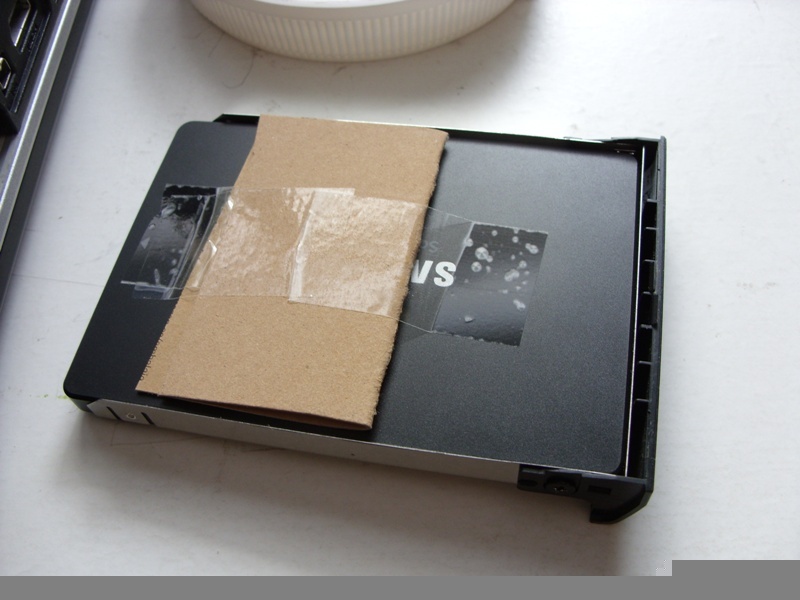 The photo below shows the disk ready to be refitted to the computer, you will see that the cardboard is on the bottom, so it lifts up the end of the disk as it slides into the slot. 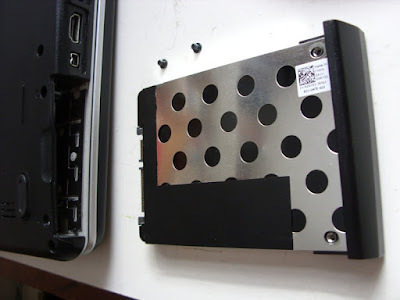 The two black screws in this picture are the ones which secure the tray into the computer after you have fitted back in the slot. 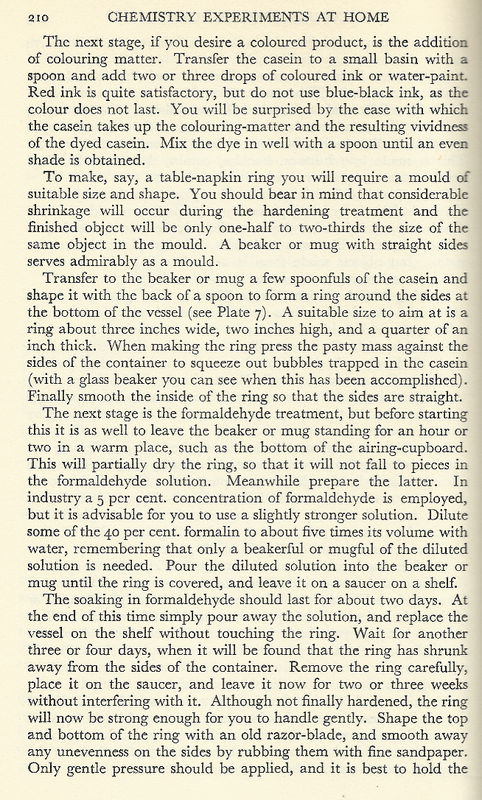 So really the mechanics are very simple. 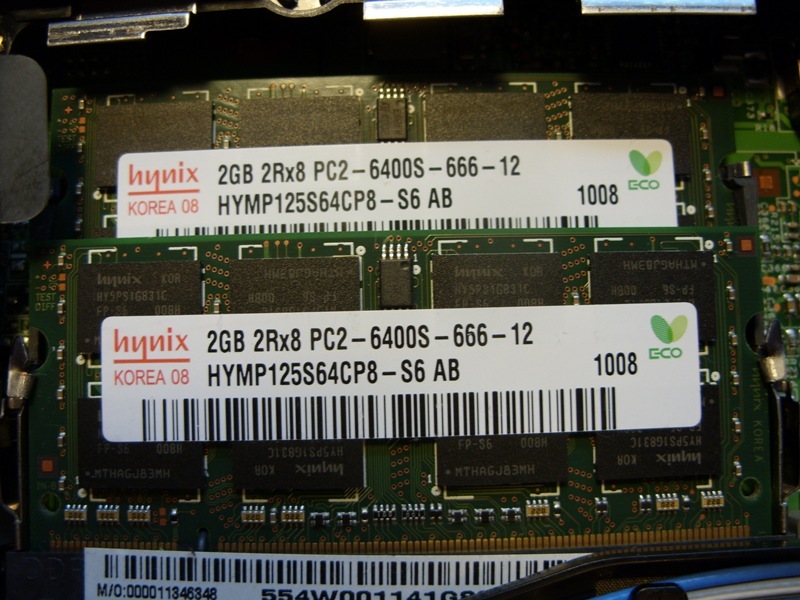 However I should emphasize the need to SHUT DOWN the computer before changing the disk drive (or the memory) - don't just hibernate it. And take out the battery too - some parts of the motherboard could still be powered and also the computer could be started accidentally if a button is pressed when handling it. 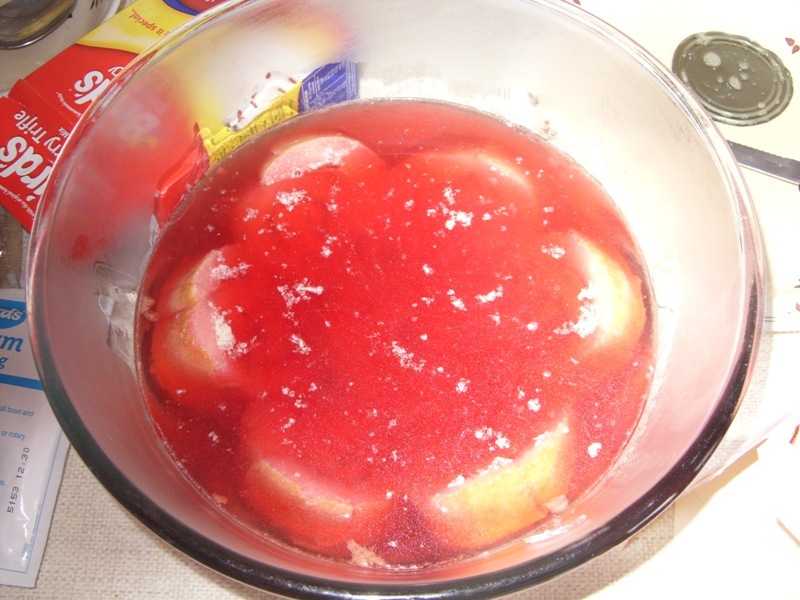 The other part of the process is the "cloning" procedure. The Samsung SSD comes with a CD or DVD of software to do this, but we used some other program that my son had already used to do clone his laptop disk. It is called Macrium Reflect Free and is a free trial. Before doing any cloning, it is a good idea to uninstall any unused software and do a Disk Cleanup. In fact we managed to free up about 50Gb of disk space (a big chunk of that was FlightsimX which was no longer used). 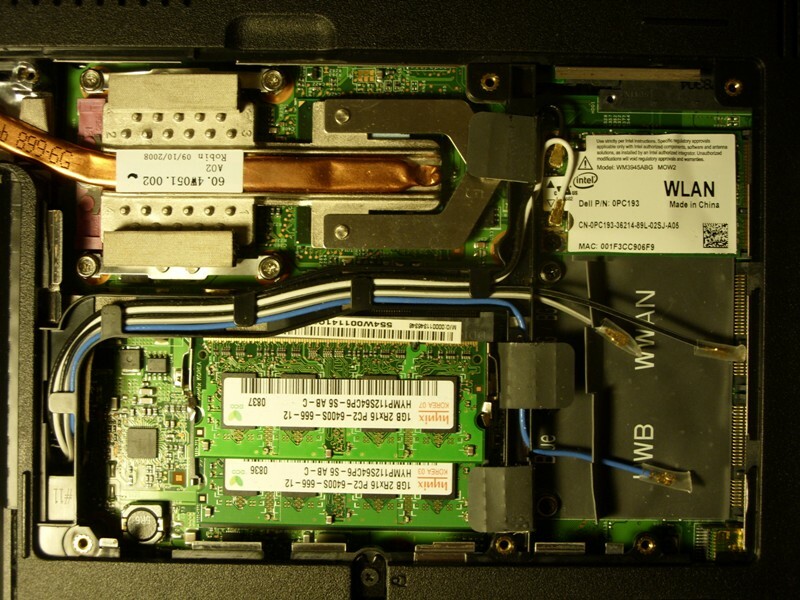 We plugged the laptop's old disk and the SSD into a desktop machine that had several spare SATA interface sockets. Our attempt at using a USB to SATA lead (bought from Ebay) failed part-way through the copying procedure, we are not sure why, but it is much quicker to use a direct SATA connection anyway. So that is what I would recommend if you can get access to a suitable desk-top PC. 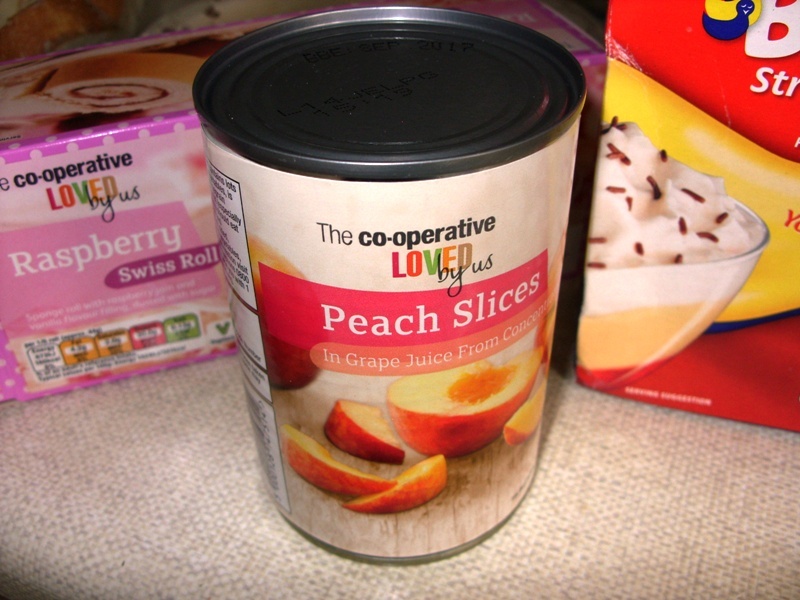 The performance is greatly improved - particularly the time taken starting applications. Windows Mail is on of the applications that is most transformed - I'm not quite sure why, but it checks the E-mail much faster now. (This might be related to Kaspersky Internet Security checking all the E-mail). The computer is almost silent for much of the time ... only the fan running. It was the noise of the fan which prompted me to investigate why Windows Update used so much system resources ... but perhaps I will tell you about that on another occasion. P.S. After fitting the SSD go into the Defragmenter and turn off any scheduled defragmentation. A Solid State Disk doesn't need defragmenting, and it may actually reduce the life of the disk. Plus ... it will be one less thing that the computer is doing "in the background"! A nice E-mail from Ofcom arrived with a Notice of Variation attached to it. 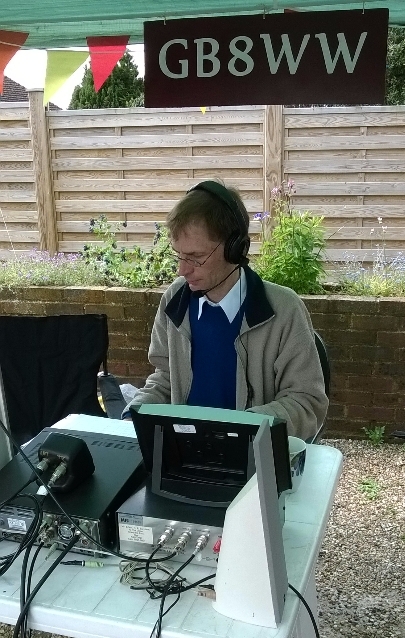 This permits operation of a special event station GB8WW for the Mills on the Air weekend, 14/15th May 2016. 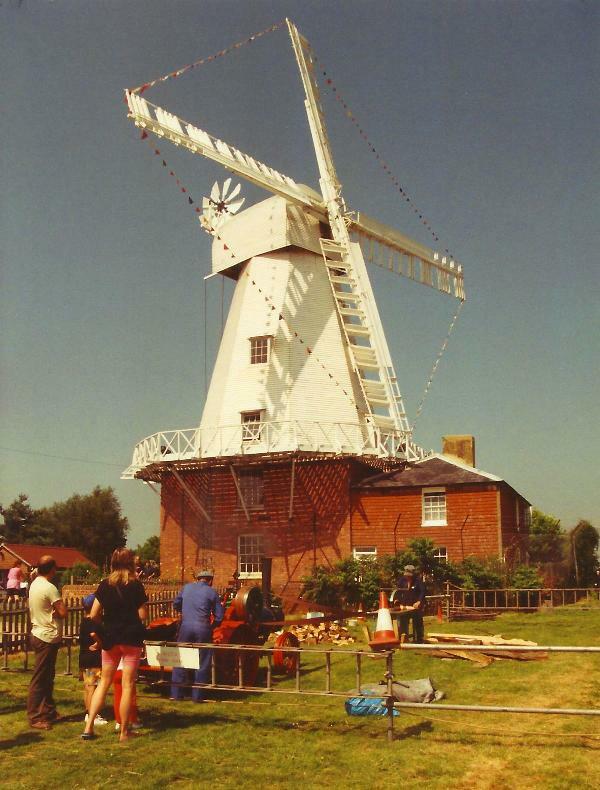 So we are looking forward to a bit of portable operation at the Open Day for National Mills Week at Willesborough Windmill. I found and scanned a nice picture I took at an open day in 1994 - not much has changed! Hoping to operate the station with my good friend Peter, G8WMZ, and any other willing volunteers who can be found. Used my Yeasu FT60e and an HB9CV to listen to astronaut Tim Peake as he conducted a schools contact with a school in Rickmansworth.